1 A None No Power Seat 1 A is a Business Class Bulkhead seat where the close proximity to the galleys may be bothersome as this seat opens inwards towards the aisle. 1 D None No Power Seat 1 D is a standard Business Class Bulkhead seat. Passengers traveling with infants are often seated here as there is a bassinet in this row. 1 G None No Power Seat 1 G is a standard Business Class Bulkhead seat. Passengers traveling with infants are often seated here as there is a bassinet in this row. 1 K None No Power Seat 1 K is a Business Class Bulkhead seat where the close proximity to the galleys may be bothersome as this seat opens inwards towards the aisle. 12 A None No Power Seat 12 A is a Premium Economy Class Bulkhead seat that is missing a footrest. Passengers traveling with infants are often seated here as there is a bassinet in this row. The tray table may be in the armrest, causing the armrest to be immovable and slightly reducing seat width. There may be no floor storage during take-off and landing. 12 C None No Power Seat 12 C is a Premium Economy Class Bulkhead seat that is missing a footrest. Passengers traveling with infants are often seated here as there is a bassinet in this row. The tray table may be in the armrest, causing the armrest to be immovable and slightly reducing seat width. There may be no floor storage during take-off and landing. 12 D None No Power Seat 12 D is a Premium Economy Class Bulkhead seat that is missing a footrest. Passengers traveling with infants are often seated here as there is a bassinet in this row. The tray table may be in the armrest, causing the armrest to be immovable and slightly reducing seat width. There may be no floor storage during take-off and landing. 12 E None No Power Seat 12 E is a Premium Economy Class Bulkhead seat that is missing a footrest. Passengers traveling with infants are often seated here as there is a bassinet in this row. The tray table may be in the armrest, causing the armrest to be immovable and slightly reducing seat width. There may be no floor storage during take-off and landing. 12 G None No Power Seat 12 G is a Premium Economy Class Bulkhead seat that is missing a footrest. Passengers traveling with infants are often seated here as there is a bassinet in this row. The tray table may be in the armrest, causing the armrest to be immovable and slightly reducing seat width. There may be no floor storage during take-off and landing. 12 H None No Power Seat 12 H is a Premium Economy Class Bulkhead seat that is missing a footrest. Passengers traveling with infants are often seated here as there is a bassinet in this row. The tray table may be in the armrest, causing the armrest to be immovable and slightly reducing seat width. There may be no floor storage during take-off and landing. 12 K None No Power Seat 12 K is a Premium Economy Class Bulkhead seat that is missing a footrest. Passengers traveling with infants are often seated here as there is a bassinet in this row. The tray table may be in the armrest, causing the armrest to be immovable and slightly reducing seat width. There may be no floor storage during take-off and landing. 13 A None No Power Seat 13 A is a standard Premium Economy Class seat. 13 C None No Power Seat 13 C is a standard Premium Economy Class seat. 13 D None No Power Seat 13 D is a standard Premium Economy Class seat. 13 E None No Power Seat 13 E is a standard Premium Economy Class seat. 13 G None No Power Seat 13 G is a standard Premium Economy Class seat. 13 H None No Power Seat 13 H is a standard Premium Economy Class seat. 13 K None No Power Seat 13 K is a standard Premium Economy Class seat. 14 A None No Power Seat 14 A is a standard Premium Economy Class seat. 14 C None No Power Seat 14 C is a standard Premium Economy Class seat. 14 D None No Power Seat 14 D is a standard Premium Economy Class seat. 14 E None No Power Seat 14 E is a standard Premium Economy Class seat. 14 G None No Power Seat 14 G is a standard Premium Economy Class seat. 14 H None No Power Seat 14 H is a standard Premium Economy Class seat. 14 K None No Power Seat 14 K is a standard Premium Economy Class seat. 18 A None No Power Seat 18 A is an Economy Class Bulkhead seat with extra legroom. This seat is designated by Air Canada as a Preferred seat. Passengers traveling with infants are often seated here as there is a bassinet in this row. The tray table is in the armrest, making the armrest immovable and slightly reducing seat width. There may be no floor storage during take-off and landing. 18 B None No Power Seat 18 B is an Economy Class Bulkhead seat with extra legroom. This seat is designated by Air Canada as a Preferred seat. Passengers traveling with infants are often seated here as there is a bassinet in this row. The tray table is in the armrest, making the armrest immovable and slightly reducing seat width. There may be no floor storage during take-off and landing. 18 C None No Power Seat 18 C is an Economy Class Bulkhead seat with extra legroom. This seat is designated by Air Canada as a Preferred seat. Passengers traveling with infants are often seated here as there is a bassinet in this row. The tray table is in the armrest, making the armrest immovable and slightly reducing seat width. There may be no floor storage during take-off and landing. 18 D None No Power Seat 18 D is an Economy Class Bulkhead seat with extra legroom. This seat is designated by Air Canada as a Preferred seat. Passengers traveling with infants are often seated here as there is a bassinet in this row. The tray table is in the armrest, making the armrest immovable and slightly reducing seat width. There may be no floor storage during take-off and landing. 18 E None No Power Seat 18 E is an Economy Class Bulkhead seat with extra legroom. This seat is designated by Air Canada as a Preferred seat. Passengers traveling with infants are often seated here as there is a bassinet in this row. The tray table is in the armrest, making the armrest immovable and slightly reducing seat width. There may be no floor storage during take-off and landing. 18 G None No Power Seat 18 G is an Economy Class Bulkhead seat with extra legroom. This seat is designated by Air Canada as a Preferred seat. Passengers traveling with infants are often seated here as there is a bassinet in this row. The tray table is in the armrest, making the armrest immovable and slightly reducing seat width. There may be no floor storage during take-off and landing. 18 H None No Power Seat 18 H is an Economy Class Bulkhead seat with extra legroom. This seat is designated by Air Canada as a Preferred seat. Passengers traveling with infants are often seated here as there is a bassinet in this row. The tray table is in the armrest, making the armrest immovable and slightly reducing seat width. There may be no floor storage during take-off and landing. 18 J None No Power Seat 18 J is an Economy Class Bulkhead seat with extra legroom. This seat is designated by Air Canada as a Preferred seat. Passengers traveling with infants are often seated here as there is a bassinet in this row. The tray table is in the armrest, making the armrest immovable and slightly reducing seat width. There may be no floor storage during take-off and landing. 18 K None No Power Seat 18 K is an Economy Class Bulkhead seat with extra legroom. This seat is designated by Air Canada as a Preferred seat. Passengers traveling with infants are often seated here as there is a bassinet in this row. The tray table is in the armrest, making the armrest immovable and slightly reducing seat width. There may be no floor storage during take-off and landing. 29 D None No Power Seat 29 D is a standard Economy Class seat however, the close proximity to the lavatories may be bothersome. 29 E None No Power Seat 29 E is a standard Economy Class seat however, the close proximity to the lavatories may be bothersome. 29 G None No Power Seat 29 G is a standard Economy Class seat however, the close proximity to the lavatories may be bothersome. 30 A None No Power Seat 30 A is a standard Economy Class seat that is missing a window. The proximity to the lavatories may be bothersome. 30 B None No Power Seat 30 B is a standard Economy Class seat however, the close proximity to the lavatories may be bothersome. 30 C None No Power Seat 30 C is a standard Economy Class seat however, the close proximity to the lavatories may be bothersome. 30 H None No Power Seat 30 H is a standard Economy Class seat however, the close proximity to the lavatories may be bothersome. 30 J None No Power Seat 30 J is a standard Economy Class seat however, the close proximity to the lavatories may be bothersome. 30 K None No Power Seat 30 K is a standard Economy Class seat that is missing a window. The proximity to the lavatories may be bothersome. 31 A None No Power Seat 31 A is an Economy Class Exit Row seat that due to the curvature of the fuselage has less space and has a misaligned window. The proximity to the lavatory may be bothersome as people may congregate in this area. This seat is designated by Air Canada as a Preferred seat. The tray table is in the armrest making the armrest immovable and slightly reducing seat width. There may be no floor storage during take-off and landing. 31 B None No Power Seat 31 B is an Economy Class Exit Row seat that may have extra legroom. However the close proximity to the lavatory may be bothersome as people may congregate in this area. This seat is designated by Air Canada as a Preferred seat. The tray table is in the armrest making the armrest immovable and slightly reducing seat width. There may be no floor storage during take-off and landing. 31 C None No Power Seat 31 C is an Economy Class Exit Row seat that may have extra legroom. However the close proximity to the lavatory may be bothersome as people may congregate in this area. This seat is designated by Air Canada as a Preferred seat. The tray table is in the armrest making the armrest immovable and slightly reducing seat width. There may be no floor storage during take-off and landing. 31 D None No Power Seat 31 D is an Economy Class Exit Row seat that may have extra legroom. However the close proximity to the lavatory may be bothersome as people may congregate in this area. This seat is designated by Air Canada as a Preferred seat. The tray table is in the armrest making the armrest immovable and slightly reducing seat width. There may be no floor storage during take-off and landing. 31 E None No Power Seat 31 E is an Economy Class Exit Row seat that may have extra legroom. However the close proximity to the lavatory may be bothersome as people may congregate in this area. This seat is designated by Air Canada as a Preferred seat. The tray table is in the armrest making the armrest immovable and slightly reducing seat width. There may be no floor storage during take-off and landing. 31 G None No Power Seat 31 G is an Economy Class Exit Row seat that may have extra legroom. However the close proximity to the lavatory may be bothersome as people may congregate in this area. This seat is designated by Air Canada as a Preferred seat. The tray table is in the armrest making the armrest immovable and slightly reducing seat width. There may be no floor storage during take-off and landing. 31 H None No Power Seat 31 H is an Economy Class Exit Row seat that may have extra legroom. However the close proximity to the lavatory may be bothersome as people may congregate in this area. This seat is designated by Air Canada as a Preferred seat. The tray table is in the armrest making the armrest immovable and slightly reducing seat width. There may be no floor storage during take-off and landing. 31 J None No Power Seat 31 J is an Economy Class Exit Row seat that may have extra legroom. However the close proximity to the lavatory may be bothersome as people may congregate in this area. This seat is designated by Air Canada as a Preferred seat. The tray table is in the armrest making the armrest immovable and slightly reducing seat width. There may be no floor storage during take-off and landing. 31 K None No Power Seat 31 K is an Economy Class Exit Row seat that due to the curvature of the fuselage has less space and has a misaligned window. The proximity to the lavatory may be bothersome as people may congregate in this area. This seat is designated by Air Canada as a Preferred seat. The tray table is in the armrest making the armrest immovable and slightly reducing seat width. There may be no floor storage during take-off and landing. 38 A None No Power Seat 38 A is a standard Economy Class seat that has a misaligned window. 38 K None No Power Seat 38 K is a standard Economy Class seat that has a misaligned window. 39 A None No Power Seat 39 A is a standard Economy Class seat that has a misaligned window. 39 D None No Power Seat 39 D is a standard Economy Class seat. This seat does not have overhead storage. 39 E None No Power Seat 39 E is a standard Economy Class seat. This seat does not have overhead storage. 39 G None No Power Seat 39 G is a standard Economy Class seat. This seat does not have overhead storage. 39 K None No Power Seat 39 K is a standard Economy Class seat that has a misaligned window. 40 A None No Power Seat 40 A is a standard Economy Class seat in the last row of the plane however, the close proximity to the lavatories and galley may be bothersome. 40 B None No Power Seat 40 B is a standard Economy Class seat in the last row of the plane however, the close proximity to the lavatories and galley may be bothersome. 40 C None No Power Seat 40 C is a standard Economy Class seat in the last row of the plane however, the close proximity to the lavatories and galley may be bothersome. 40 D None No Power Seat 40 D is a standard Economy Class seat. This seat does not have overhead storage. 40 E None No Power Seat 40 E is a standard Economy Class seat. This seat does not have overhead storage. 40 G None No Power Seat 40 G is a standard Economy Class seat. This seat does not have overhead storage. 40 H None No Power Seat 40 H is a standard Economy Class seat in the last row of the plane however, the close proximity to the lavatories and galley may be bothersome. 40 J None No Power Seat 40 J is a standard Economy Class seat in the last row of the plane however, the close proximity to the lavatories and galley may be bothersome. 40 K None No Power Seat 40 K is a standard Economy Class seat in the last row of the plane however, the close proximity to the lavatories and galley may be bothersome. 41 D None No Power Seat 41 D is a standard Economy Class seat. This seat does not have overhead storage. 41 E None No Power Seat 41 E is a standard Economy Class seat. This seat does not have overhead storage. 41 G None No Power Seat 41 G is a standard Economy Class seat. This seat does not have overhead storage. 42 D None No Power Seat 42 D is a standard Economy Class seat in the last row of the plane however, the close proximity to the lavatories and galley may be bothersome. This seat does not have overhead storage. 42 E None No Power Seat 42 E is a standard Economy Class seat in the last row of the plane however, the close proximity to the lavatories and galley may be bothersome. This seat does not have overhead storage. 42 G None No Power Seat 42 G is a standard Economy Class seat in the last row of the plane however, the close proximity to the lavatories and galley may be bothersome. This seat does not have overhead storage. 5 A None No Power Seat 5 A is a standard Business Class seat that is missing a window. 5 G None No Power Seat 5 G is a standard Business Class seat. 5 K None No Power Seat 5 K is a standard Business Class seat that is missing a window. Air Canada offers Audio and Video on Demand with personal touch screen TVs at every seat. Air Canada offers Audio and Video on Demand with personal touch screen TVs at every seat. Business Class can enjoy an 18" touch screen, Premium Economy an 11" touch screen, and Economy Class a 9" touch screen. 110v AC powerports are available at every seat in Business and Premium Economy Class. Economy Class is equipped with 2 ports for every three seats. USB ports are available for every seat in the aircraft. 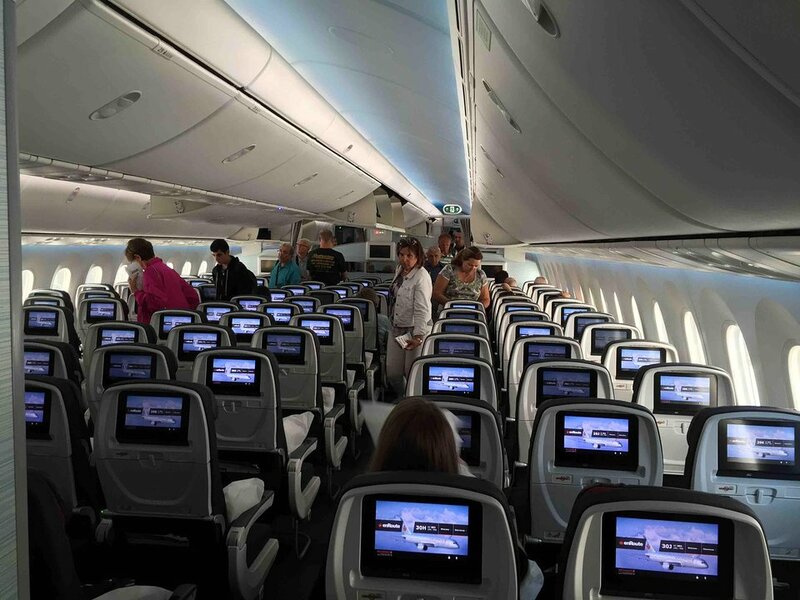 Air Canada introduces its 787-8 aircraft on its initial routes from Toronto to Tokyo and Tel Aviv. This aircraft operates in a three class configuration with 20 seats in Business Class, 21 seats in Premium Economy, and 210 seats in Economy Class. Business Class flat bed seating features a full length massage function with each seat getting direct aisle access, and Economy Class featuring new slimline seats. 5A is a lay-flat business class seat that, unfortunately, doesn't have any windows in it. However, being at the back of business class means less foot traffic from the front galley and bathrooms for business class. It's a peaceful and comfortable spot to sit if you don't need to look at the scenery. All the premium economy seats are pretty good on this plane, though I've never sat in the middle nor on the bulkhead row. I've been on this plane 3 times now between YVR and PVG, and twice SFO-YUL. Food and service on the Shanghai legs definitely a cut above the SF-Montreal route. I try to stay in rows 13 and 14, I tested an empty bulkhead seat (row 12) and it would definitely cramp my leg room (I'm 6'2). I like 13 and 14 K on west bound legs, and 13 or 14 A on east bound, so that I face north and away from the sun. 787 does not have slide down window covers, it's LED dimming only which is not 100% opaque. Overall, this is a nice premium economy product, much better than the legacy US carriers on the same routes, and comparable to the good Asian airlines like Cathay or EVA. 5D and 5G are more narrow than most seats to accommodate access to the galley behind. At least 3 inches. Also of note 5K is reserved for pilot use only. Air Canada is the only airline I know to reserve a premium location for staff use. Not only are there no windows at both 5K and 5A, there is no stowage space above the centre seats, which means a competition for the (very little) space above the window seats. This being said, the service and meals are excellent. Do not fly economy on any 787 with a 3-=3-3 config which is every airline other than Japan. The seats are simply too small and too uncomfortable. My seat back was kicked at least 100 times by the man behind me who obviously could not fit in his seat. I have some lower back problems but can survive a long fllight if they are using good seats. This time I was in pain for 13.5 hours and now have two world class bruises on my back from simply sitting in that seat. Never again. This preferred seat has generous legroom - unlike some Preferred Seats that have bulkheads ahead. However, the seat had a noticeable transverse frame member across the buttocks, and no protection from hands and knees of the passenger behind. To and from Paris, myself and my wife. Excellent seats. One can enter and exit without bothering anyone. Room enough to stand and stretch and to fully extend your legs. Never have we felt so refreshed after a 10 hour flight. Well worth the extra $100. As a bonus Seat 18C was not occupied on either flight. Other than sometimes people bump into you waiting for the lav, the seat is not terrible for a shorter person. I found myself propping my leg up on the padded curved fuselage and it was nice to sleep against. Other than that the seat is indeed a little narrow and if you get up a lot the handle on the side of the plane is helpful. It is hard to put the traytable back if your seatmate is asleep. I have sat in this seat twice for this same flight and have had a decent experience. Overall I would give it 8/10. If you are more than 5ft 5in I would not sit here as you will be cramped. This would have to be one of the worst seats on the plane along with most of row 31. In 31H, once the lights go down on a long haul light, people trip over your feet constantly (and I am only 5ft4in), and have little respect for (or are unaware of) your personal space. No seat pocket for this seat, so absolutely nowhere to place anything during the flight. During food service, flight attendants park food trolleys in front of you. Very unpleasant journey where you feel as though you are in the way of everybody and everything. These seats should not attract the preferred seat premium. I really loved flying on the Boeing 787-8 Dreamliner with Air Canada. 21A had sufficient legroom, as do the other standard economy seats, and I'm 6 feet tall, so I should know :) The entertainment system is pretty great, especially since I was on a North American flight rather than an intercontinental one. Plenty of new release movies and TV shows to enjoy. The cabin was clean and in great condition. There are outlets between the seats and USB ports at every seat, which is really awesome for charging your devices - I enjoyed this immensely. There are free drinks (alcohol and San Pellegrino is extra), and the buy-on-board food has a good selection, and great quality, I loved the pizza I ordered, absolutely delicious! The windows on the 787 were fun as always to play around with, and since it was a nighttime flight and a transcon, the FAs let you control your own windows the entire time. Contrary to what some other members have stated, seat padding was quite good for a slimline seat, definitely better than the DL 738 I flew on before, where I was in agony after an hour into that 5-hour flight. This one I was comfortable the entire time. Lavatories are also quite spacious and generally are kept clean by the lovely FAs. This is a standard seat on this plane. The AV system was pleasant to use. The seast are exacty as described by many other reviewers, thin padding, limited leg room and minimal seat width. I am 5'2" and travel to Australia twice a year for business and this was the most uncomfortable plane I have travelled on. I just cannot begin to understand why AC would use this seating configuration on such a long haul plane. The extra $$$ cannot be worth all the poor reviews. My 11yo had the window seat and enjoyed the ability to shade the window with the new system. The guy beside us was 5'10" and his knees were touching the seat in front even before the seat was reclined! This seat is extra cost due to additional leg room. Firstly the seats are very narrow (I'm an average size woman) and because of the length of the seats (short) they eventually dig into your legs, however the biggest complaint I have with this seat is the misaligned window. I pay extra because I am extremely uncomfortable in enclosed places and access to the window is very important to me. My flight from Canada to Australia was hours of trying to keep myself calm as I was plastered up against my neighbour on one side and a blank wall on the other. Air Canada should specify the lack of a window on booking, it is not worth the cost if your are booking it to deal with claustrophobia. Very unhappy with this seat. disregarding all else , just arriving without jet lag is what I valued about the 787! and it's not pleasant. 3. IFE ?? really Air Canada you should do something about this ASAP ?? It's looks great but the film selection is so limited. Sorry but thats just not serious  I cant believe that you cannot increase the selection. The screen is very nice tough and user interface great compared to other. 4. Seats head support  most of the time it can move up-down to adjust your head height. In this case not although Ive seen that the seats in premium and the first seat in eco can adjust that height. Concerning seat 22K its a regular eco seat  nothing better or worse than some others. What a pity with more comfortable seats and an updated IFE it would be perfect. As mentioned previously, this is a funnel seat and you are exposed to people and carts bumping into you. Also, if you pull up your TV screen from your armrest, it then partially blocks the aisle so the carts are guaranteed to hit it. 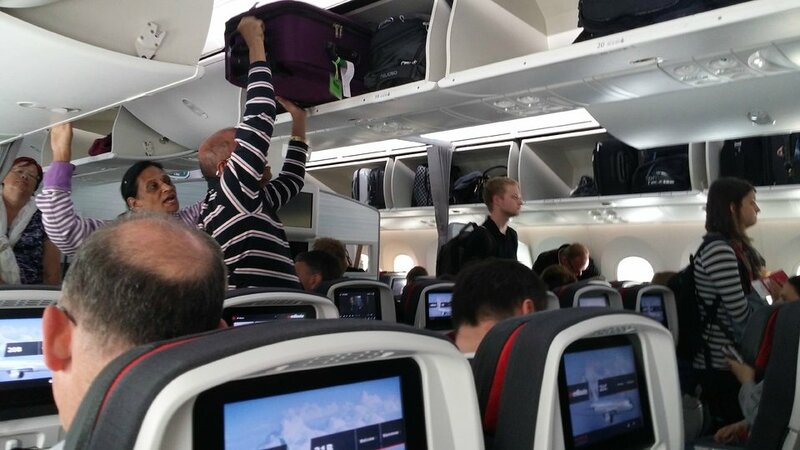 Be aware that for rows 39 back to 42, there is NO overhead storage for the center rows. Window seat which was good but I didn't really like the tinted windows. It was a 10 hour flight from Europe during the day and the sun was shining through the window. Despite turning up the tint to full, the heat was still very noticeable in the seat which I believe a movable cover from the older planes would have prevented. This was a pretty good seat. I never felt like anyone was intruding in my space like waiting for bathrooms. The extra space for the legroom and seat width was great. I have flown this plane in Premium Economy almost a dozen times, and I have sat in pretty much every seat in this class. IMO, row 14 is the best row for sleeping. Recline is still good with the bulkhead behind, and if you want to sleep right after take off (Latin American flights leave late at night), you don't have to worry about affecting somebody's meal service. Row 12 is the best for waking hours as there is nobody in front of you. Getting out from the window seat is much easier in the row. However, due to the bulkhead, you cannot stretch out as much, and thus don't take this row if you want to stretch out and sleep. The business class sets, although comfortable for relaxing, eating, etc. I found them too narrow from the hips down and felt like sleeping in a coffin. Window is badly misaligned (behind the passenger). Excellent seat, comfortable and quiet. Superb in-flight service. Will return to BNE 26 July, seat 3K. WILL comment then. This seat was directly beside the lavatory and was not pleasant for that reason both due to people standing and also the occasional odour. Avoid if possible. I have recently had the displeasure of flying in this plane from Vancouver to Brisbane return. The seats in economy are in a 3-3-3 arrangement. They are crammed in so tight that it is impossible to get comfortable. The seats are 17.3" wide, anyone broad shouldered or large sitting beside you and their shoulders/bodies are ramming into you. The leg space is non-existant, even short people have their knees crammed against the seat in front, I was unable to straighten my knees for the entire flight. The seats are a fabric sling and the poor guy behind me was tall, I felt his knees in my back the entire flight. The aisles are so narrow that the cart barely fits through, if you are in the aisle seat you will likely get banged up by it when it comes through. No room to get up and walk in that aisle, definitely not doctor recommended. The seats advertise a 5" recline but it isn't even really accurate, as the whole seat bottom pushes forward and up cutting off the circulation in your legs. They go from painful to numb. These seats pack more in and add to the profit margins. That is until the class action suits start happening after people find they have associated health problems after flying 15 hours in these torture racks. 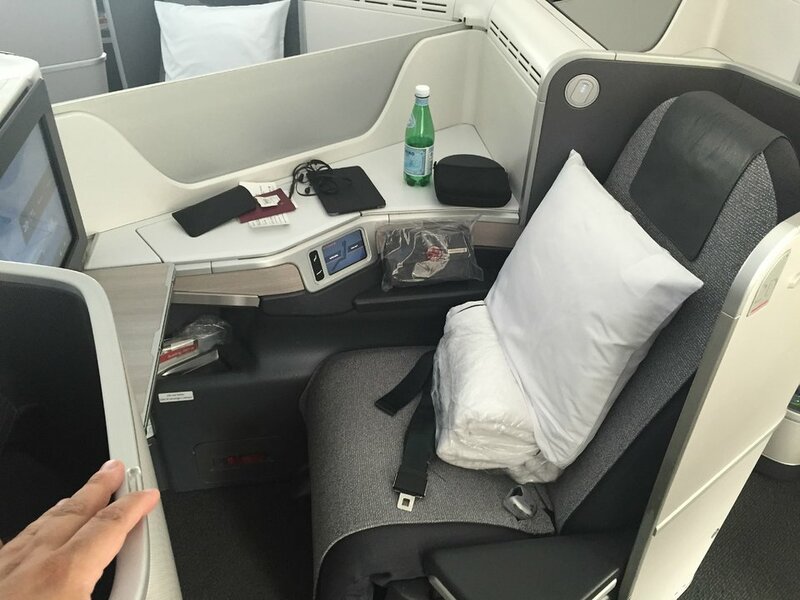 I flew from Toronto to Zurich and back in Air Canada's premium economy cabin. I loved this seat, especially because it was in the middle of the already intimate cabin. F/A's were nice, food was enjoyable, I was even allowed to go visit the flight deck after we arrived at the gate in Zurich. The Dreamliner is very quiet inside, with nice lighting. Would fly again. This actually pertains to all seats near windows on all 787s. Although the electrochromatically darkened windows are fun and interesting, they have one fatal flaw! When trying to sleep at night I noted flashes of light but could not figure out from whence they came. It turns out that the light was coming from one of my nearby seatmate's TV and was being REFLECTED off of my darkened but mirror-like window. This was actually quite annoying! Give me the old fashioned window shades or figure out how to render the window surface less reflective on all upcoming 787s please! The Dreamliner has the potential to be a lovely aircraft, quiet, better air quality, large windows BUT unfortunately due to the 9 across seating in Economy, the seats are narrow and uncomfortable and the aisles are also narrow. The front edge of the seat seems to be raised and therefore presses into the back of your thighs. Any more than a 6-7 hour flight with this configuration would be hard to bear. The best business class cabin of any North American carrier though these seats are not quite "fully lie flat" as advertised. The seats are still comfortable but not quite as comfortable as the classic pods that are still found on the 767 & A330 aircraft. The trade off is that these pods provide a much more functional work space with a nice storage compartment. The AVOD system is excellent and the automatic window dimming is a huge improvement over the traditional pull down window shades. Business class on the 787 is certain a comfortable way to travel and is especially good on flights of 4+ hours. 8 hours in a Dreamliner in a daytime flight was a nightmare. An overnight flight would only be worse. This was the most uncomfortable and unpleasant experience. All previous comments about seat and aisle layout are valid. This seat appeared to have no padding in the small of the back. I felt every knee contact, tray table movement, water or magazine placement from the fellow behind who was average sized male adult. The placement of the controls for lights and entertainment system etc in the armrest is a joke. Frequently, my reading light or monitor screen would be shut off by my neighbours placing his arm on the armrest- go figure! The seat was comfortable but the footrest in the front was not. As a short person I could not get comfortable with it. The service was good however I feel that the amount I paid for Economy Plus I should have at least got some free snacks. Air Canada charges for every little thing. The seat is very narrow and uncomfortable. In fact, the most uncomfortable seat I've ever flown on a major airline. TERRIBLE!!! The 787-8 economy class on a long haul should be avoided at any cost. Biggest issue -9 seats in a row are so tight that you will touch shoulders even with small frame passengers sitting next to you. Sitting in a window seat my shoulder was touching plane's wall, no free space, and I am not a big guy. The seats are very hard and uncomfortable. It took 2 days for the pain in my rear end to go away. I also agree with other critical comments by others: bathrooms, food, etc. This is arguably the worst seat on the plane. Every comment mentioned as a concern is valid. The fuselage crowds the legroom laterally so if you want to stretch your legs you need to draw your right leg in towards the left. The window is behind your right shoulder, benefitting 32K, so the fuselage crowds you towards the centre seat. There is no window for this seat. The in-flight magazines, air sickness bags, etc for 31H-K are in a bulging slot just in front of your right shoulder. Masses gather at the lavatory. The video screen is inconveniently placed. The only place to put a bag is in the overhead compartment. Avoid this seat if possible. Definitely do not pay the Preferred Seat supplement. This plane was uncomfortable and dirty in economy. The seating was very cramped. The person sitting next to me was normal sized, but due to the narrow seats, I was forced to lean against the wall during the entire flight, which caused a cramp in my lower back that lasted for several days after the flight. There was just barely enough room to get my knees in; fortunately, the person in front of me did not want to recline. The plane also needed a good cleaning. There were crumbs all over the seat back in front of me and greasy fingerprints along the wall. The area around the fresh air vents was black throughout the cabin, despite the fact that this is a new plane. This aircraft has the highest ratio of Air Canada aircraft people to toilets (52.5 pax per toilet). Be prepared for long lines past your seat and a strong bladder. I paid the extra for this seat and must say it was worth it. I had had a long day, getting up at 3:30 AM mountain time in Missoula MT in order to change my flight on Alaskan Airways, so by the time I boarded this flight I was extremely tired. I slept like a log for the first half of the flight and the crew didn't try to serve me the meal which I didn't want. The person sitting in the middle seat was very easily able to get past without disturbing me, so all in all, this was a great investment. This seat is in a bad position everyone bumps into you when they board and the FA's bump you all flight. Tons of leg room but no rest because everyone keeps bumping ypu. Normally I pay for upgrades to premium economy because I dread having my knees crushed by people reclining in front of me. But I have to say I find the 787's standard economy quite tolerable, even on a 7-8 hour flight between LHR and YYZ. The seat bottom moves forward as the seat back tilts back, helping to spare your knees when the person in front of you inevitably decides to recline. The newer inflight entertainment system on this aircraft is notably better than the standard Air Canada seatback screens (with most movies in actual 16:9 format, gasp!) As other users have said, the terrible position of the armrest controls means you'll be accidentally turning on your (and your neighbour's) overhead light, powering off your screen and calling the flight attendants multiple times. _Perhaps_ this is a good seat for a smaller person but the fuselage tapers in front of you as it deals with the exit door. Restricting your movement on your right side. The same in reverse for 18A. Being right handed I would have a aisle seat with my right hand free. Row 30 on this plane is not fit for human travel. Seat 30A has no window and is claustrophobic, cramped, and we listened to the toilet flush for most of our 7 + hour overnight flight from Toronto to Paris. This was worse than a seat on AC rouge!! All seats in this row should be red on your seat map. You are better off at the very back of the plane, I think the red seat is row 45. Row 30 is far worse!! In my opinion, this is the best business class I have ever been on. AC easily beats other airlines like Lufthansa and Austrian in design, tech and comfort. I flew YYZ-ZRH and its was the one of the best flights I have ever been on. Flight attendants very nice and friendly, and a good selection of meals. Great seat! Lots of space, beautiful accent lighting in the footwell and along the privacy divider, responsive seat controls, huge tray table with multiple positions. The only downside is there are no air vents since there are no center bins in this cabin. Excellent aircraft that is finely appointed. This was a great flight. Pretty empty so I got all three seats. More importantly, i was behind the wing and got to see how the plane really works and literally lifts you into the air. I flew KQ and the staff, while very friendly, were put out if they had to wake you. Ambient lighting was amazing. FLY THESE PLANES!!! I flew on the 787 recently and have to say I actually enjoyed it. I actually got some sleep on the plane, about 4-5 hours and this is unusual. Yes, the seat cushion is a bit thin, but I feel fine. I didn't feel too cramped, but it did help there was no one occupying the middle seat. And the windows dimmed really well, even in the bright sunshine outside. Smooth flight and the humidity and cabin pressure probably helped a lot. Great cabin concept with a good view despite wing and engine!! Air Canada's Dreamliners are widely overestimated. Sure they are better than the old 767 but barely. They might be great in Business Class but if you are in the back of the plane, as most mere mortals are, the cabin is cramped, seats and pitch are very narrow. Seat cushion is very thin and hard. It all becomes very uncomfortable after only three hours. Unless you get an astoundingly good deal on the price of your ticket, I would not recommend flying these birds on anything longer than a Eastern Canada - Europe flight. Warning: flying Vancouver-Brisbane nonstop in this plane is going to be nightmarish... If Air Canada really wants to make their Dreamliners as revolutionary as they pretend, they should do like British Airways: removing a seat abreast, going from 9 to 8 in economy. Same for Premium Eco. Very good seat, almost economy plus, as you can stretch your legs because there's only a curtain and no wall in front of you. The seats themselves in business are very nice and spacious the tray table works well and there is a lot of room. However, the entertainment system seems to have serious problems on both flights it crashed repeatedly and since the seat controls are on LCD that crashed too. Too small space for 7 hrs flight. This air plane should be for short or charter flight. Seat comfort is ok and new IFE takes iPhone headsets which as just as well as this cheapskate airline doesn't hand free ones out till well into the flight. Larger windows mean inboard passengers get a bit of a view out and cabin crew can dim the whole lot on one side with a master control on the emergency door as low sun was annoying people. 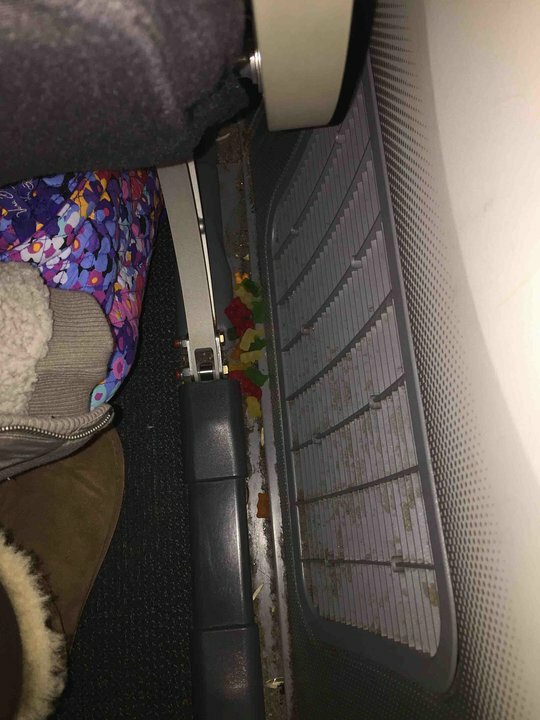 787 seems to have a problem with a/c water dripping onto window passengers, this occurred briefly on this flight and has been reported on Air NZ's 789s. Air Canada is skimpy on service and meals are appalling. Eat before boarding. This was my third trip in that seat which is excellent! Far enough from either galley. Ask fir an extra comforter to put on the seat before you lie down. You'll sleep much better. Superb crew and service. AC still serves sparkling wine on the ground and only switches to champagne once air-borne. Tacky! The warning about these seats needs to be stronger - the closet next to your feet / in front of you at this seat is hugely disruptive as it is where crew keep their personal belongings and some other stuff for the plane - they were in and out of the closet many, many times - and noisily too - during the flight - waking me up several times. Very, very poor design by AC. Agree with comments about narrowness of both the seats and the aisles. I am larger (6'3", 250lbs), and my choices seemed to be to either intrude on the space of passenger in 33E or be consistently run into by flight attendants and carts traversing the starboard aisle. IFE was good, though the AC flight attendants seemed to not want me to wear my over-ear headphones until we were above 10k feet - they kept scolding me to take them off. Also, the positioning of the IFE controls on the armrest is terrible, as noted by others. I think I turned on 33E's overhead light at least 5-6 times on a 9 hour flight. Excellent seat, worth the price. Not a lot of traffic in the front of Economy class. Decent IFE, decent food. Perfect flight! I was very impressed with the 787 and the overall Air Canada experience. I flew Air Canada to Tokyo and United Airlines back from Beijing. Air Canada was superior in every way. I traveled both ways between NRT and YYZ on AC's Dreamliner Premium Economy Seats(13C from NRT to YYZ and 14D from YYZ and NRT). Wide space and good service (including special dinner menu for premium economy passengers and priority checkin, boarding and baggage) and worth paying the extra money. I wish premium economy seats also had legrest. We recently traveled in Premium Economy in 14 H&K, the seats are roomy, with plenty of leg room. Great service with beef tenderloin for dinner. The had higher humidity than most aircraft, we didnt dry out like usual. Love the lighting and dimming windows. The movie selection could have been better, "chick flicks" please. aisles are narrower than other boeings so if you are sitting on the aisles expect the flight attendants to bump into you as they move through the cabin...these are not small people on log haul flights! The seat cushions and back are so thin that you can feel any movement that the passenger behind you does in his/her the seat pocket. The Business/first seats are quite roomy - compared to the usual pod or the new studio-type on the 777. I am 6'7", and I could lay flat and sleep [and I did]. The seat had two windows, which added more than most similar style lie-flat seats. This is the worst seat - besides seat 30H on the plane in my opinion. Don't know why they would plan a bathroom right next to passengers. If you had an aisle seat like I did, passengers would bump into you, you will hear the bathroom door banging all through out the flight (mine was a 12 hour flight!!) and you can also smell the bathroom. Terrible planning is all I can say. Never never never subject a passenger to this. It seems like everyone on this side of the plane was using the bathroom although it shows that there was 4 bathrooms. I am sure it was the same for 30H. Horrible experience on this flight and I have already written a complaint to AC. 22K CPHYYZ was very comfortable! The flight was fully booked, but the larger overhead space allowed me to store most of my luggage above me. What I did keep under my seat I was able to put to the left of the seating area, which allowed me to stretch out fully under the seat in front. The windowshades are a wonderful way to control the aircraft. Free food and beverages three times on the flight. I'm 6 ft. 4 in. and was totally comfortable for the entire flight! Very good premium economy flight from YYZ to Tel Aviv. Seat was comfortable and service was excellent. Only knock is lack of space when seat in front is reclined. Otherwise, it was a great 10 hour flight. Seat was perfectly adequate for the Vancouver to Tokyo flight, at least for me (5'7"); the seat reclined just enough to allow me to sleep, and the legroom was fine although not remarkable. The only real annoyance was the placement of the entertainment system controls on the armrest, although after a couple of hours I was able to avoid mashing the reading light button without thinking about it. Premium Economy is good on Air Canada. Reasonably large seat and reasonable legroom. Seat in front reclines too much. good service, decent food. Fair price. something that NZ, QF and CX are good on the space. What a fabulous BOEING aircraft. Extremely comfortable seats, beautiful cabin and almost silent inside - this has to be the best aircraft I've ever flown in. Great service from Air Canada as always. If only they had configured those awful 777-300ER's on the Hong Kong run like this! Business Class on the 788 is simply superb! The seats are incredibly comfortable, the cabin is very quiet. Avoid row 1 - too close to the galley. Row 5 is actually fine, in spite of the proximity to the toilets and galley. Very comfortable seat - my daughter and I sat in 13 D and E (aisle and centre) and they were excellent choices. Even the centre seat was comfortable. Lots of legroom, good plugins for our tablets. Video screen was often hit by people in the aisle and would fall down. Very irritating. Limited legroom due to the bulk. I had an empty seat next tome so i could straighten my legs, otherwise it would be impossible. Great food and service. Seat is located where isle is funneling from PE to Y. I boarded early and had at least 20 people/ bags etc bump into me while I sat in 18C. During the flight I had service carts bump into my legs. Bulkhead seats seemed to be less wide than other seats due to tables/ tv screens folding into armrests. Normally I prefer isle seats, but on this flight it seemed 18A was a better choice. Having travelled extensively for over 65 years , without a doubt this was far and away the most comfortable seat I have ever travelled in. It exceeded my expectations and was in many respects better than first class seats that I have flown in. The seat is very good for sleeping. It just takes one button and the bed is flat and ready to sleep. I`m 180 cm tall and 97 kilos and had no problem with that seat, but for people taller then that it could be difficult to find a relaxed position. The massage of course never worked, but then I never had a seat in any business or first class till now that worked.As it was a night flight I slept almost till London. But the crew make a lot of noise in the galley just in front, opening cupboards and slamming it shut. The big window wich can be darkened is fantastic. People use the space in front of the seats to go from one aile to another. First time on this aircraft. Extra bulkead worth picking this seat over others in prwmium economy. Seat was upgraded from economy for $350. Given distance of flight, well worth the extra comfort and room. Before I review the seat and leg space please make note that I have small build, 5'5" (165 cm) and 132 pounds (60kg). Leg room was ok as long as you don't have carry on luggage on the floor. The seat reclined to a relative comfortable position (as far as an economy seat may be comfortable) although I didn't note a major improvement over other/older Air Canada planes, including the 767-3 which was replaced by this plane on this route. The big problem with the seating in economy is the 3X3X3 configuration. The seats are NARROW. I was lucky that nobody was sitting in the middle seat next to my window seat. The seat felt cramped without a person sitting next to me. It would've been almost unbearable to fly for 10 hours with someone next to me. Remember, I'm smaller than the average person and couldn't imagine how an average or large person could last in an economy seat for such a long flight. Air Canada definitely dropped the ball with this seat configuration on an international flight. It might work for a short haul flight but not on a 10 hour flight. Simply outrageous design decision. Another inexplicable design decision was to mount controls on the arm rest, exactly where you'd put your arm. There were several incidents witnessed during the flight where passengers accidentally pressed the flight attendant button. The flight attendants reaction was as if it was a common occurrence. I myself accidentally pressed the seat lighting button a few times and changed the volume on my flight entertainment program. This is a very annoying design flaw, especially if a stranger sitting next to you will push the buttons on your flight entertainment controls. The aircraft is lovely, but I agree with other user comments on the stupidity of the armrest controls - one wonders who made that decision. My comment is to how terribly uncomfortable the seats are in general for a long haul flight in 'hospitality'. I am 6' and 200 lbs and it was a very unpleasant experience and I think it is the most uncomfortable aircraft I have been on in 20+ years. I much prefer the 777. Must agree with other user about armrest button problem in Economy. Buttons are exactly under the spot where the arm rests! While people around me were sleeping or resting or watching movies, they were constantly setting off attendant call button, turning reading light on or off, or suddenly sending volume up or down, all unintentionally. Surprising design error - how can nobody have realized this before signing off?. There is an obvious fix, however: disable the armrest buttons. All controls are duplicated on seat-back display, which makes more sense. Or they could develop a cover for the buttons. Absolutely fantastic! I only fly J and this is by far, by far THE best business class seating and configuration there is - at least on Air Canada. The Air Canada 787 configuration is a nightmare in both Y and Premium Y because entertainment system controls are placed on top of the armrest and one's arm is constantly rubbing on the buttons. Add to this that the earphone wire comes out of the seat in front of you and crosses the table which is "an accident waiting to happen" as demonstrated by several spills during my 01 June flight. This is an Air Canada deficiency as BA's outlet is in the seat (like AC's are on their 777 and 767's). In Premium Economy seats in Row 12 are missing the footrests that seats in rows 13 and 14 have. Seats 12A and 12K each have only one window as there is a "blank" at the bulkhead. This could be claustrophobic for some - yet cosy for others. Stretching space is somewhat limited for taller passengers. Air Canada flies 1 versions of Boeing 787-8 (788).